The walk up San Luca is brutal if you are planning an easy stroll but it’s “the way” for residents of the Saragozza neighborhood to get a workout rain or shine. I met my friend from Hong Kong (living in Bologna almost fifteen years) so we too could join the crowd this summer walking up to the church of San Luca for a bit of exercise. I have been up the long winding porticoed walk many times but this time because of the heat or the lively conversation I was seriously out of breath. The conversation deliciously centered on food. 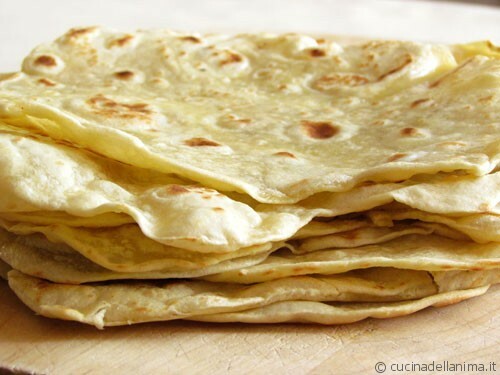 There are so many recipes that are similar around the world…one being unleavened flat bread, like Piadine. I asked how she ate Piadine at home. Do you eat them the traditional way, with prosciutto or the soft fresh cheese squaquerone or do you put a Chinese twist on them? Piadina or Piada…a classic Romagnola version of unleavened bread which usually contains a filling of cheese, cured meat or vegetables. The Piadina originates from the Apennines area of Forlì, Cesena and Rimini and also from Ravenna. It is made with white flour lard or olive oil, salt and water. “Behold it is smooth as paper and as big as the moon,” wrote a nineteenth-century Italian poet, Giovanni Pascoli, in a work entitled “La Piada.” The stands where you buy it are called Piadinari and they aren’t just fast-food joints but they represent a distinct food culture. Where to find the best stands? Who makes them fresh with quality fillings? My friend from Hong Kong said the Piadine reminded her of an unleavened flat bread from China (Jin Bing or Cong You Bing with scallions) . But we lingered most on talking about crispy Peking duck wrapped in Chinese pancakes with hoisin sauce. We talked about if we could substitute the Piadine for the Chinese pancakes. Why not? Because of my American influences I think of the flat unleavened breads like tortillas and I love to make fajitas. When I want a quick dinner or lunch I buy the premade Piadine replacing the tortillas and then fry up red and green peppers, onions and beef with Mexican seasoning to put inside my warmed Piadine. Of course if I can find avocados and sour cream it adds to recreating this American Tex-Mex favorite with a Romagnola twist.